I remember as a kid wrestling with my older brother. Like most brothers, we were not particularly nice to each other most of the time. Often it was a "wedgie" or a "snake bite" or sometimes a "nip-twist". I didn't realize that a "purple nurple" was synonymous with the latter, until I urban dictionary'd it today. I have to admit that once I get the words "purple nurple" in my brain, it's hard to get it out. I can be heard singing it often throughout the house in a variety of musical styles, just about every time I walk past the plant. Plant people are like that. Which brings me to my favorite plant of the day - Tavaresia barklyi x Orbea variegata 'Purple Nurple'. After being potted up in 2014, this plant started out in my kitchen window. It made it through winter and spring and then this summer, it along with its friends, spent the summer in my sunny driveway. The plants got some shade under the canopy of the black walnut tree, but also a good dose of hot direct sun. I was pretty sure I was going to burn them all up with our especially hot summer. They also got pretty good doses of water from the sprinklers as I was watering like crazy to keep up with the heat. Thankfully I didn't drown them either. I lost a couple random plants, but they were in bad shape before they went outside for summer holiday. This is the first bloom and I have to say I love it! What a great cultivar name for the plant. That flower is absolutely amazing. The markings remind me of the Rafflesia flowers when they first start to develop. It looks like it should have its own reality show. Is it different from Stapellia, or have the re-namers been at it again? Orbea and Tavaresia are different genera, but many look the same plant wise. The only way to tell some of them apart is to see the blooms. I don't have a good way to describe how they are different though. Stepelia, Huerna, Orbea, Caralluma, Hoodia and several others often look alike but with subtle differences. So cool! And such a funny name. I like it when someone obviously has a sense of humor in naming their plants. Thanks for sharing the source. I've been drooling over a few things on there in the last couple days. Your Purple Nurple is certainly an intriguing plant! 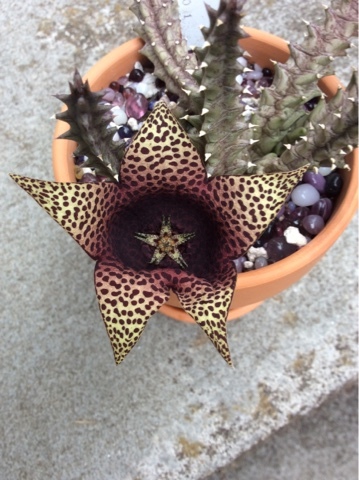 Like Ricki said, it reminds me a lot of Stapelia. You have the most unusual plants. Oh, that's cool. 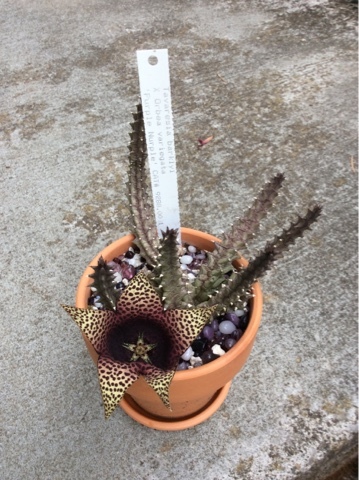 Like a Stapelia but minus the stink - I hope!